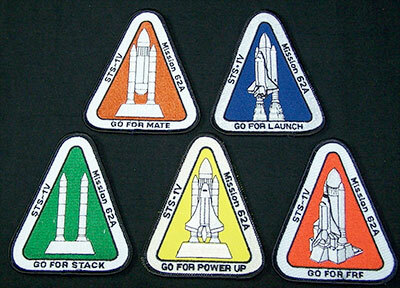 Go to Patch Index, Space Shuttle, "Funny, Rare & Personal." Neat! Next time someone sees Guy Gardner ask him if he recalls anything about 62A patch proposals (or show him the page) — I remember him writing me that they didn't finalize their patch at the time of 51L, so I'm curious as to whether they were narrowed down Tim's proposals or had considered others. Note, on every patch I had the vehicle launching in the wrong direction. I had it going north instead of south. There is no up or down in space. Secondly, I don't think the crew would have liked a shuttle nose down (or facing the bottom) in a patch... 'twould look like a dive bomber or the shuttle crashing. I really like the "B" version, showing the SRB's separating. Kind of looks like a DOD version of the STS-8 patch. Tim, did Crippen ever get back to you indicating any preference of those four? I would love to know if any member of the 62A crew had a "favorite" or if any other proposals were under consideration. I never heard from Bob Crippen again. I did meet him at the rededication of the Astronaut Memorial in honor of the Columbia crew so it really wasn't the time or place to ask, "So Crip do you remember me designing your V1 patch? What did you think?" Hart the reason north or south are important is because you don't want to have the SRB's come down on someone in the great north west. They would have launched south over the south east Pacific. I would have had the orbiter facing "up" but the Earth "upside down". My favorite was the first one shown, the shield shape. It was the most original of the four. I designed "B" to resemble the STS-7 patch. "C" was going to continue the use of an Eagle on DoD missions and "D" was meant to resemble the STS-1 patch. I figured that if he liked that type of design before it might be accepted again. It was the first time the astronaut didn't say "No thanks". So all in all a good experience that helped me. I liked B the best. 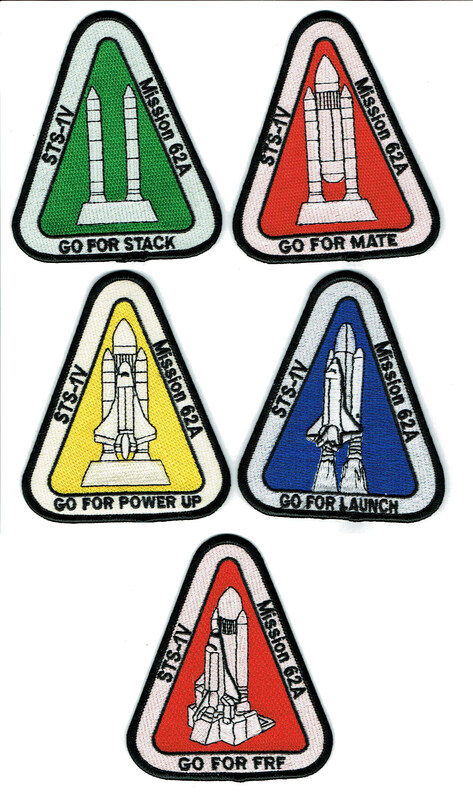 As seen on eBay is this set of five patches relating to preflight and launch activities for the Discovery STS-62A mission that was to be the first shuttle launch from Vandenberg; cancelled after the Challenger disaster. First time I've seen the patches for sale. Anyone have any information to share regarding these patches? Manufacturer, how many made, etc.? Two different sets like this exist. The official set (I have only seen one of the patches from this set in 20 years of collecting) does not have the "Mission 62A" designation, but something like "Flow A". 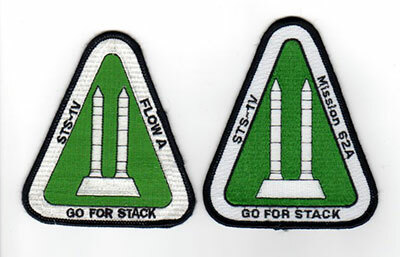 If you are interested in original patches that were actually circulating at Vandenberg AFB at the time, the set with "Flow A" (or maybe it was "Flow B") is the one to go after. The set shown earlier in this thread, is a souvenir set produced by Eagle One Aerospace ("the good Randy") in Virginia in the mid 1990's. These were available at the time for something like $5,95 each. Yes Erik, it is "Flow A" which is on the original patches. They are also slightly smaller and have bare cloth backs to them, not plastic coated like the Eagle One Aerospace souvenir ones. Thanks for the info guys. I had seen the decals before, but not the patches. I would love to know if any member of the 62A crew had a "favorite" or if any other proposals were under consideration. The one with the seals. 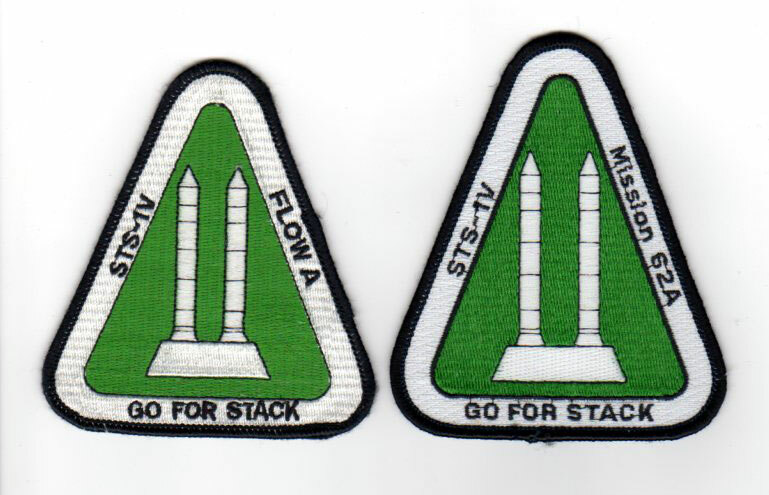 It looks like there's another reproduction set of the STS-1V/Mission 62A milestone patches out there. Recently (early October 2018) the full set (sold as individual patches) from seller "Popular Patch" appeared. The quality is very high-fidelity, it takes a close look to see that they're not the ones from Eagle One Aerospace. The letter sizing is slightly larger, but most of the details are reproduced well. Plastic coated on back.